Fractal Design has just unveiled a different take on a new line of all-in-one liquid coolers, called the Celsius series. 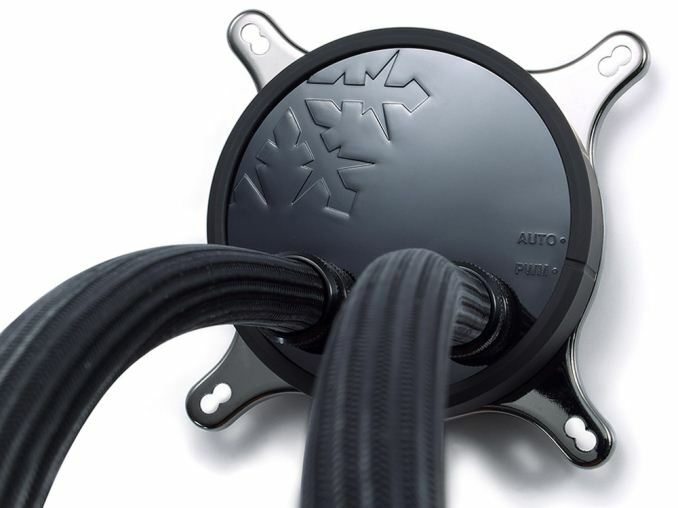 Unlike conventional AIOs, these new models are not actually closed-loop: they have threaded fittings on the radiator side in order to allow for expansion possibilities with common DIY liquid cooling components. The two units being launched are the Celsius S24 and Celsius S36, which feature 240mm and 360mm radiators respectively. The radiators feature aluminium housings and fins, and they are both around 30mm thick. As mentioned above, it is the fittings that are the really interesting part of this new product line. While the CPU block fittings are non-removable, the radiator fittings are knurled metal and feature a standard G 1/4" thread. Since the G 1/4" fitting is so common in the custom liquid cooling market, the expansion options are vast. As long as you add additional coolant, you could loop in a second waterblock, a second radiator, or even a reservoir. As a result, you cannot consider these Celsius models to be strictly closed-loop coolers (CLCs), but instead something of a new hybrid. There is an integrated fan hub located between the radiator's inlet and output ports, with two free 4-pin fan headers on the S24 model and three unoccupied 4-pin fan headers on the S36 model. Surprisingly, these fan headers are actually attached to a hardware fan controller that is built into the CPU block. 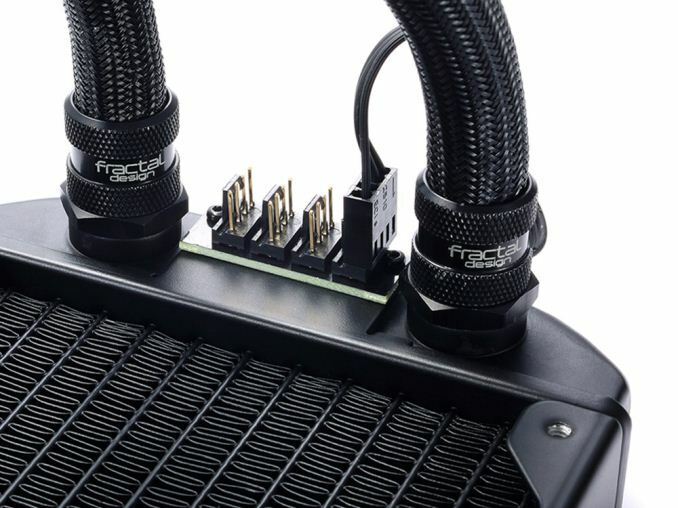 Fractal Design has been incredibly clever and slipped the cable in between the sleeving and the rubber tubing, and they have run it the entire 400m tubing length to the CPU block/pump/fan controller unit. The fan controller has two user-selectable modes, either "auto" (which is based on the liquid temperature and handled by the cooler itself), or a "PWM" mode (which gives control to the motherboard and is based on the actual CPU temperature). In either mode, both the pump and the fan speeds will be increased/decreased since they are all PWM capable. 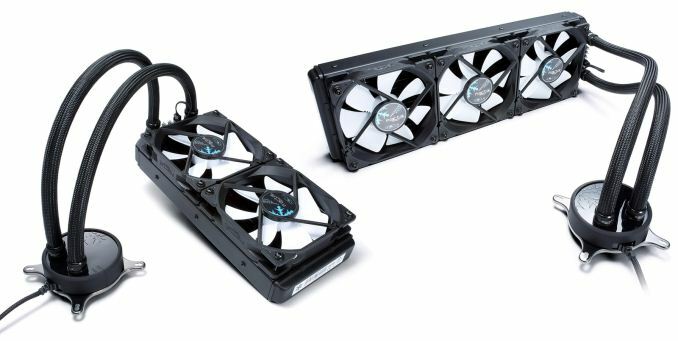 Speaking of fans, these Celsius coolers come with either two or three of the high-quality Dynamic X2 GP-12 PWM fans that Fractal Design launched last summer. They have rotational speeds of between 500-2000 RPM, and use "LLS" bearings, with a claimed 32.2 dB(A) full speed noise levels, a stated airflow of 87.6 CFM, 2.30mm H2O of static pressure, and they are rated for up to 100,000 hours of use. 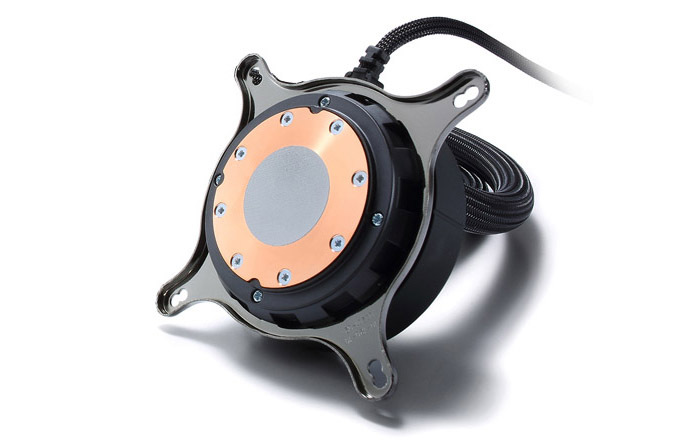 The pump, which is built into the CPU block housing, has a rotational speed of between 1950-3150 RPM, and a full speed noise level of 20.0 dB(A). This gives it a 50,000 hour MTBF (or 5.7 years full use). Total power consumption for the Celsius S36 is listed at 9.0W, while the smaller S24 clocks in at 6.6W. All of this is powered from a single fan header on your motherboard, so a dedicated water pump header with high amperage capabilities is probably a good thing. The CPU block has a copper base and features sound-dampening materials in order to reduce operating noise output. High thermal conductivity thermal paste is pre-applied. These liquid coolers support all modern CPU sockets, including the latest AMD AM4 platform. We have no word on availability, but the Fractal Design Celsius S24 will retail for $109 USD and the larger Fractal Design Celsius S36 for $119 USD. Both of these units are covered by a five-year warranty.